WASHINGTON, D.C. -- President Donald Trump lashed out at his own Justice Department Monday for seeking the Supreme Court's backing for a "watered down, politically correct version" of the travel ban he signed in March instead of a broader directive that was also blocked by the courts. In a series of early morning tweets, Trump urged the Justice Department to ask for an "expedited hearing" at the high court and seek a "much tougher version" of the order temporarily blocking entry to the U.S. from a half-dozen majority Muslim countries. He called the courts, which have blocked both versions of the travel ban, "slow and political." It's unclear whether the president has conveyed his requests to the Justice Department, which he oversees, in a forum other than Twitter. The White House did not immediately respond to requests for that information. The president has renewed his push for the travel ban in the wake of the vehicle and knife attack in London that left seven people dead and dozens injured. The Islamic State has claimed responsibility for the attack. The president spent much of the weekend responding to the attack on Twitter. In one instance, he leveled an inaccurate criticism of London Mayor Sadiq Khan, saying the mayor was telling people there was "no reason to be alarmed" about the attack. The mayor had instead been telling London residents not to be concerned by a stepped-up police presence in the city following the attack. "No reason to be alarmed," Khan said, describing a more visible presence as "one of things the police and all of us need to do to make sure we are as safe as we possibly can be." Later, the mayor's spokesman said he was too busy to respond to Trump's "ill-informed" tweet. 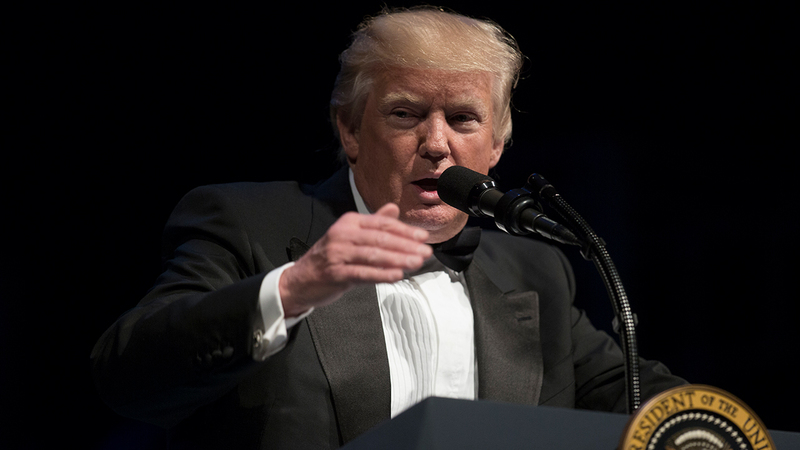 Trump also addressed the London attack Sunday night at the conclusion of a fundraiser for Ford's Theater, scene of one of the most famous acts of bloodshed in American history: the assassination of President Abraham Lincoln. "America sends our thoughts and prayers and our deepest sympathies to the victims of this evil slaughter and we renew our resolve, stronger than ever before, to protect the United States and its allies from a vile enemy that has waged war on innocent life, and it's gone on too long," Trump said. Senior White House adviser Kellyanne Conway on Monday condemned what she called the media's "obsession with covering everything he says on Twitter and very little of what he does as president." In an appearance on NBC's "Today Show," Conway said people should pay attention to what the president is doing, saying people in England had tried to inform authorities about the terrorists before the attacks happened. "If you're going to see something and say something, it has to be followed by, do something," she said. "And this president is trying to do something to protect the people of this country." Trump said he had spoken with British Prime Minister Theresa May to express America's "unwavering support" and offer U.S. assistance as the British government works to protect its citizens and bring the guilty to justice. British authorities say that have identified the three attackers but have not revealed that information publicly. Trump has used attacks around the world to justify his pursuit of the travel and immigration ban, one of his first acts since taking office. The first order, which was signed at the end of his first week in office, was hastily unveiled without significant input from top Trump national security advisers or the agencies tasked with implementing the order. After that order was struck down by the courts, the administration decided to write a second directive rather than appeal the initial ban to the Supreme Court. The narrower order temporarily halts entry to the U.S. from Iran, Libya, Somalia, Sudan, Syria and Yemen is necessary to protect U.S. national security. Iraq was removed from the list of banned countries in the second order and an indefinite halt to entry from Syrian refugees was replaced by a temporary pause. Still, the courts have also blocked that directive. Last week, the Justice Department formally asked the Supreme Court to let a ban be put in place. The high court also is being asked to uphold the constitutionality of the Trump travel policy, which lower courts have blocked because it shows anti-Muslim prejudice. A date for the court to hear arguments in the case was not immediately set.